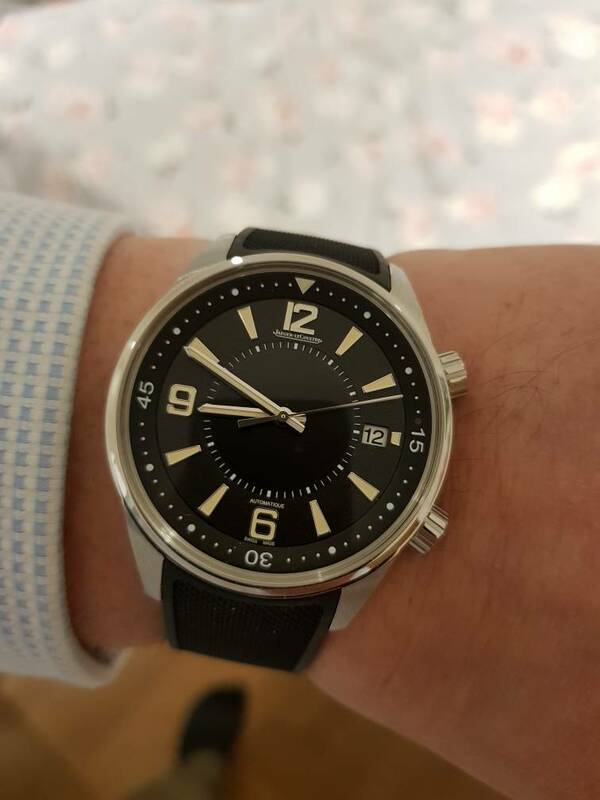 Despite being a known 'flipper' round these parts and consequently having many watches come in and out of my collection I very rarely do reviews. For me to put a review here or on any of the other fora I frequent a watch has to be extraordinary in my humble opinion. Watches to date that have been bestowed with such an 'honour' include a couple of Grand Seikos - the SBGE001 that led to the infamous 'Tora! Tora! Tora!' thread that some of the forum stalwarts might remember, as well as the SBGR061. The Breitling B50 got a review, as did the Blancpain 50 Fathoms. The Moser & Cie Mayu received a review as well as the Omega Dark Side of the Moon. And finally the Ming 19.03 received a mini review as a kind of 'honourable mention'. These watches all had one thing in common - they seriously impressed me enough to stand out as reference pieces in their particular niches. The overall 'winner' being the Moser for its sheer splendidness. And now it's time for another review. 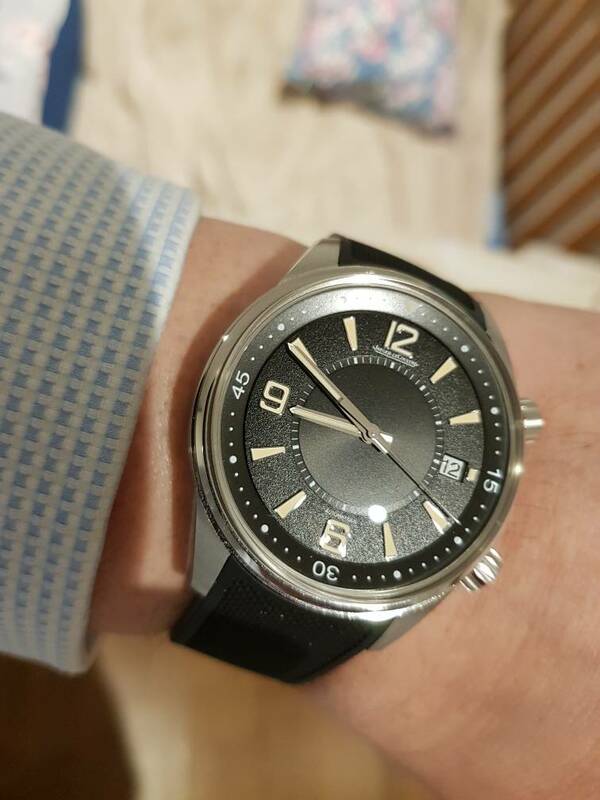 The JLC Polaris Date. I've had a few JLCs before, all on the more dressy side of the spectrum. 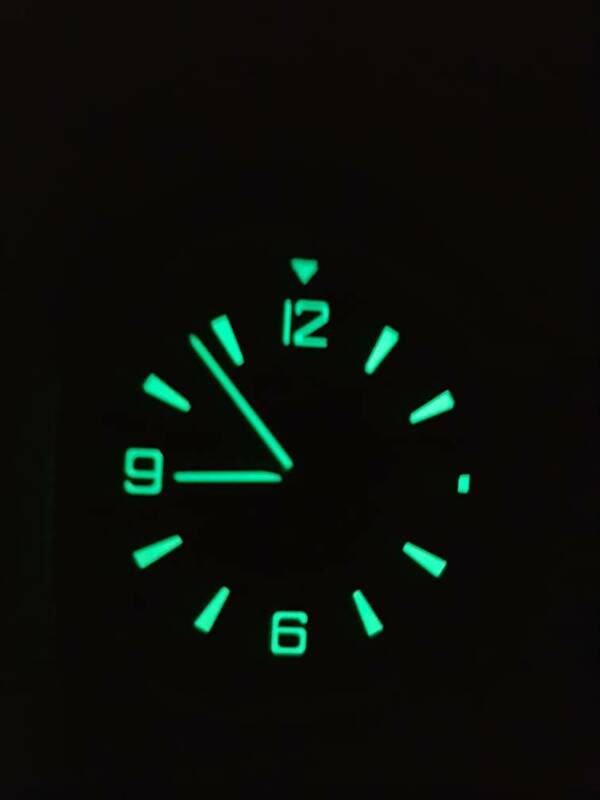 So the Polaris Date is my first foray into the sportier side of JLC and was actually a knee jerk purchase based on frustration that none of my WTBs were being acted upon. But as it happens it was all for the best. The Polaris range was released last year in several variations. Polaris (41mm), Polaris Date (retro-styled and 42mm), a Polaris Memovox as a Ltd edition as well as a chronograph. This review is based on the Polaris Date. I'd always assumed JLC to be an upper-middle tier brand alongside Rolex, Omega, Panerai and so on. As outlined earlier I'd owned a few of the dressier pieces but I find it easier to tell real quality when a marque is not trying to be blingy and is using more subdued design and embellishments to showcase the skill of the watchmaker. So when I peered into the windows of Wempe (looking for a DJ 41) i was rather unexpectedly taken aback by the very retro-styled Polaris Date. So I ventured inside to have a look and in the words of the Thomas the Tank engine TV series narrator (as many a parent will remember) 'then there was trouble'. The watch itself is 42mm, slightly domed crystal, no bezel per se so a very large dial, relatively tall without being slab sided but first and foremost is SUPERBLY finished on the dial. Just fantastic. There are 3 finishes - a radial effect on the innermost circle of the 3 concentric circles that make up the dial. Then the circle that holds the numbers and indices has a very nice grainy textured effect. Finally the outer ring activated by the top right crown for timing purposes has a Matt effect. These all change character depending on the lighting and the overall effect is wonderful. It oozes quality and adds visual interest to what could otherwise be seen as quite a sombre looking dial. The watch has a date aperture at 3. I'm not usually a fan of date apertures however it is small and unobtrusive and for me fits in fine. Your mileage may vary. The 2 crowns are high quality with alternate polished and matt on the knurls. Really very well executed. The brushed finish of the case sides is superbly done by hand, I'd say so well that it is to brushed finishes what Zaratsu is to mirror polishing. And this brushed finish is juxtaposed with a polished finish on the edges around the crystal and also on the tapered lugs, again adding a nice contrast. And the whole package comes on a superb rubber strap - the highest quality rubber strap I've owned with a nice 'Clous de Paris' effect. The deployant clasp is nicely made although not the easiest to use as it doesn't have side pushers like (for example) an Omega clasp in order to open it. You have to pull it apart in the way you do on a PP5167. Omega wins here. But going back to my previous assumption of JLC sitting in the same category as Rolex, Omega etc. Well I don't think it does. If I compare it to a Sub Date (which has a RRP only marginally lower than this piece) then the fit and finish of the JLC is worlds apart. It's not even close and the JLC feels like the sort of watch built by watchmakers for watch enthusiasts with lots of little details and embellishments that raise a knowing nod on the part of the connoisseur. This doesn't mean that the Rolex is an inferior watch at all as of course Rolex sports watches are designed as a go anywhere reliable workhorse, it's just that the quality of the finishing on a JLC in a similar price range is on a different level. In fact quality wise I've owned a PP5167 and a Royal Oak 41mm and the JLC compares well with them. Perhaps only Grand Seiko has that obsessive attention to detail and finishing that bests this. So summing up as to where JLC sits I'd actually place it alongside Breguet, Grand Seiko and AP (all for comparable SS Sports models of course). I actually believe the fit and finish of this watch to be superior to the 5167 Aquanaut I owned, but again your mileage may vary and of course that's an entry level Patek that can't be compared with their higher end stuff. Movement accuracy has been spot on so far. Not a second gained or lost and it's one of those JLC movements that are tested for 1000 hours. Power reserve is a relatively paltry 38 hours which is perhaps my only disappointment with this piece. But I forgive it as the watch as a whole is a very coherent piece of design with fit and finishing considerably above other watches in this price range and with a vintage-themed style that is A very popular today and B works very well as JLC have avoided the 'naff-ness' that seems to pervade with some other vintage-themed watches on the market. The Polaris date looks like a vintage watch that's been found unused in NOS condition and just works from a design standpoint. Anyway that's enough waffle from me. To sum up this is a superb watch and stands out in the price bracket it competes with as a bit of a 'no-brainer' if you want a vintage themed watch made superbly well. It can be had with discount (although not as much as historically was possible - JLC have started to crack down on this (as well as raise their prices)). It costs a bit more at RRP than a Sub Date (which you' d be hard pressed to purchase anyway unless you were sleeping with the AD), is by some distance a higher quality watch and after discount will actually be cheaper than the Sub. It probably won't hold value as well as the Sub (hence the RRP discount needed) but if we were all obsessed with resale value as the primary factor in choosing a watch to buy we'd live in a very boring world where everyone was wearing Rolex and Patek Sports watches. I'm delighted with the Polaris Date. Last edited by ryanb741; 13th April 2019 at 07:31. Nice review Ryan, not a watch I have seen before, but it’s understated presence is very appealing. An excellent review Ryan. 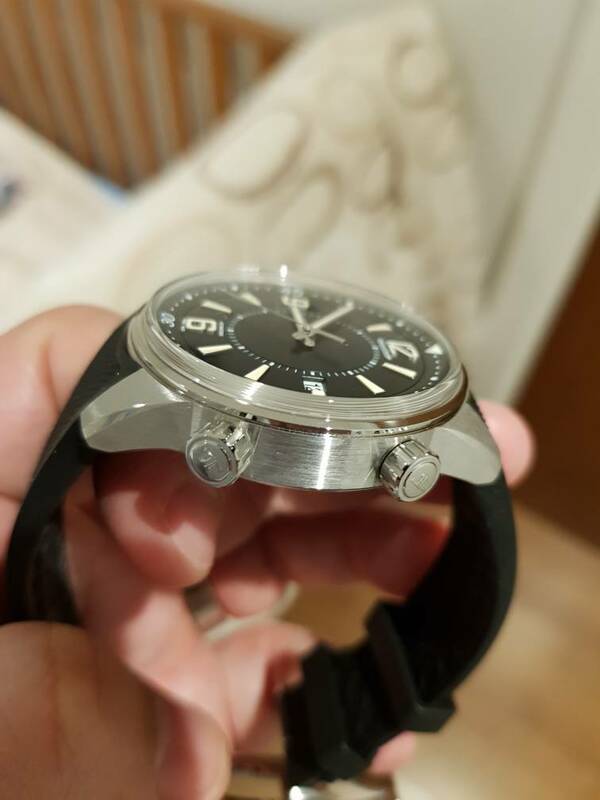 I tried on the non date version on a bracelet last year and came close to buying, it was only the size of the dial that put me off. However when I tried on the one that you have bought a month or so ago, the size of the dial didn’t dominate to the same extent. I think the bezel is slightly wider on the date version. I agree with your comments about the rubber strap. Overall a great looking watch. Last edited by gbn13; 13th April 2019 at 06:04. Lovely looking watch. I haven’t dared to ask to try one on as yet. Even before I started reading the question that arose in my mind was- which other watches has he done reviews for? And, I found the answer right there. All eight are very good choices. Have never owned a Moser and don't fancy owning one but have heard only positives here. Great review, and I also share some sentiments as I recently tried the entire polaris range and was very impressed by them. Personally i found the inner bezel abit too "soft" to change but other than that the fit and finish was superb (tho not on the Patek level). Fabulous vintage inspired watch. Congratulations. Enjoyable read - thanks for taking the time Ryan. I really enjoyed the review as well, thanks for posting. I’m saving up for another JLC. I think the dials are one of the under-appreciated features of many of them, as the finishes are very subtle. The movement in this Polaris is beautiful and from a great line within JLC that goes back a long way. I think the relatively short power reserve is a trade off against ensuring very stable accuracy. Indeed, very enjoyable. I'm honestly not surprised by what you say about the JLC finish as I think they've long had a reputation for being the best horological bang per buck out there. The thing that has long kept me back is the now (Richemont-) terrible reputation for aftercare. I wish they'd sort that. It's the only one from the current JLC that I've seriously considered buying. Love the textured dial and nice combo of classic and modern styling.........But it really needs to be 39-40mm to be perfect. Nice review, thanks for taking the time to jot down your thoughts. I saw one of these in a window this week. 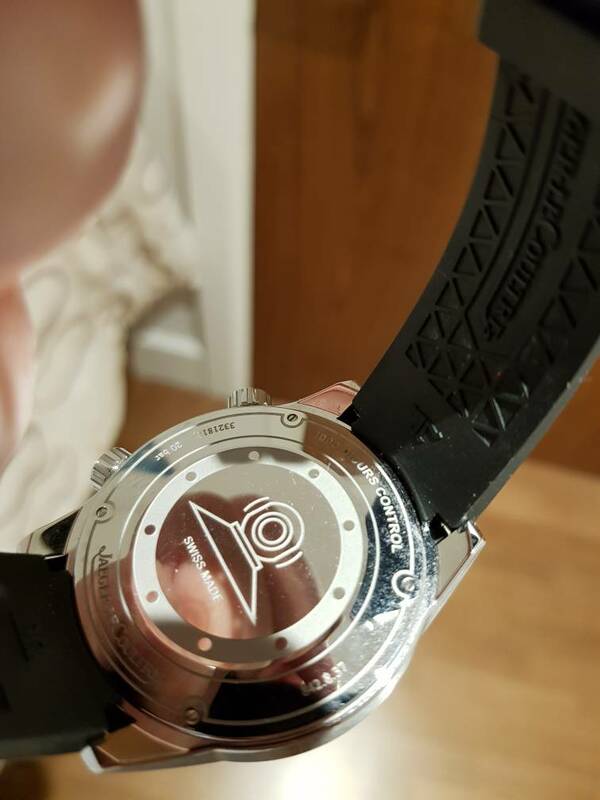 It is a lovely looking watch that I would like to take a closer look at. I loved this watch when it came out, I almost bought it but then I read that it does not have screw down crowns, apart from that top piece! I managed to get a pretty sizeable discount here in Hong Kong. 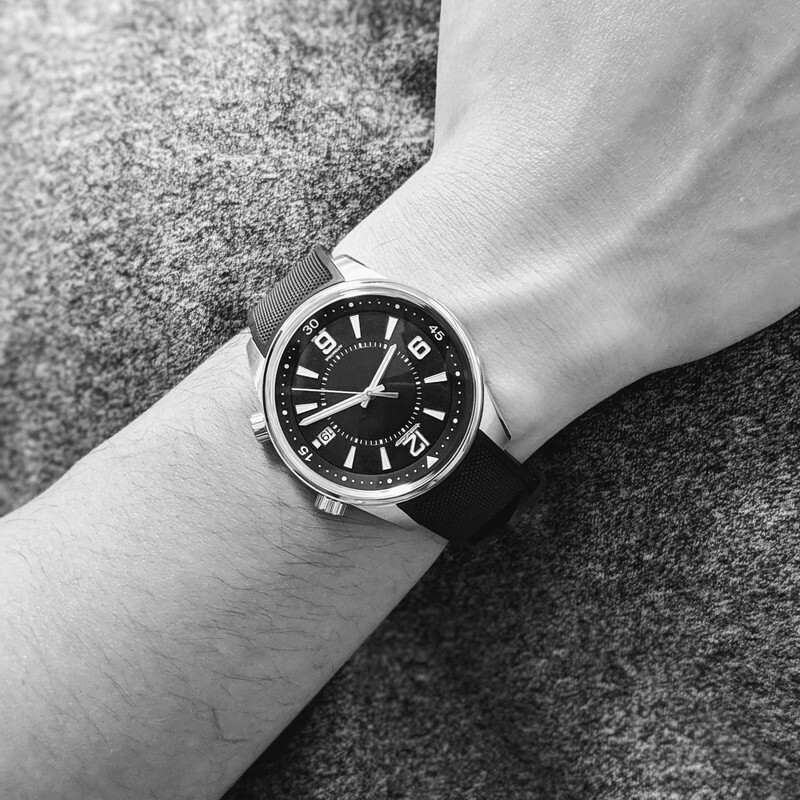 I love the understated and simplistic nature of this watch. It also wears remarkably well for a 42mm with a lug to lug of 48mm. I didn't like it initially when it was released - the whole Polaris line felt a little too safe from JLC. But I slowly grew to love its vintage charm. JLC very highly regarded in watchmaking circles or so I’m told. Nice write up, it is a lovely watch. I agree with your comments about JLC as a brand, for me they sit above rolex, omega, breitling and below patek AP. They have amazing movements all in house and the quality of the watches is very high.